Cultural Sharing is infused into all the daily activities at the Global Youth Village. Student have opportunities in workshops to share their perspectives on leadership, each which is colored by individual’s culture and background; share meals from different regions around the world; play sports and games from different countries; and even reenact traditional folktales from across the globe. Students from Japan dressed in Yukata, traditional dresses that are more casual and light weight than Kimono and taught students Origami, or traditional Japanese paper folding. Haruhi also shared her love for Japanese candy, especially the Black Thunder chocolate bar! Yum! In Ghana, students learned about Ghanaian independence (did you know Ghana was the first country in Africa to get its freedom from a colonial ruler?) and practiced greetings in “Twi”, one of the most common language in the country: “εte sεn?” – how are you? “Me ho yε, me da ase.” –I’m fine, thank you. Kofi even taught the group a traditional Ewe dance and a modern Ghanaian dance called Azonto. Naomi from the Crow Reservation in Montana introduced students to customs on the reservation – including Crow Fair, Elk Tooth Dresses and rodeo. She even showed off her rodeo skills by “Goat Roping” Zach, one of our cabin counselors! Later, Allyson, from the Northern Cheyenne Reservation teamed with Naomi to show a traditional Native boy/ girl dance. From the land of fromage (that’s French for cheese) to the Caribbean – students learned about Trinidad and Tobago from Tyrell, whose parents grew up on the island nation. Tryell got everyone’s taste buds watering describing traditional Trinidadian food (including “Bake” which looks a lot like the Fry Bread Naomi made one night with Indian Tacos). He also described the Trinidad festival “Carnival” and explained how the dress stems from dramatic performances African slaves were allowed to put only once per week when they were being transported from African to be sold in the Caribbean. Maria, our cabin counselor from Colombia, shared he culture with the students. Did you know that Colombia has the largest hippo population outside of Africa? Colombia is also famous for its delicious coffee and beautiful, relaxing beaches. 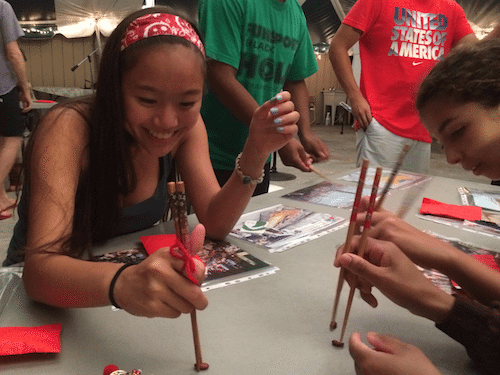 A final stop in Taiwan and main land China helped students practice their chop-stick skills, receive lucky red envelopes for future prosperity, and play a traditional Chinese stick jumping game. Yu Zhe, from the south of China also shared photos of her school and her baby sister! Maddie, from Virginia, practices her chopsticks skills. Student felt closer to one another after sharing their culture and learning about one another’s. Its not often that young people people can come together and reflect on their own traditions and backgrounds and truly be appreciated for what makes them different. 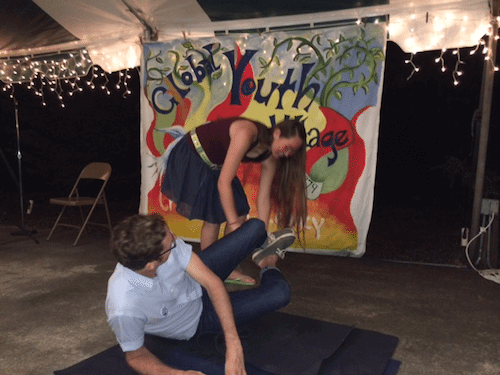 At GYV, students find that place. If you could share one thing about your culture, what would it be? Food? A game? Family pictures?